May I wish you a HAPPY & PROSPEROUS NEW YEAR 2012. And congratulations for being given a rare chance of a lifetime flying in an aerobatic aircraft during the recent LIMA. You're one of the few fortunate Malaysians given such an honour. I never had the opportunity to fly with those young and brave daredevil pilots when I was still in the service...Lucky you . Just to let you know, I'm now embarking on a lonely struggle to convince the state governments to honour those unsung and forgotten heroes. My classification of heroes are those who are physically handicapped, eg, totally blinded, legless/armless, etc, etc, due to their sacrifice in defending the sovereignty of this nation during the counter-insurgency era. And also the recipients of KPK (Kepujian Perutusan Keberanian). As you may be fully aware, KPK is one of the nation's 5 Gallantry Awards. However, unlike the others, ie, SP, PGB, JPP &PTU, KPK holders do not enjoy the benefit of the monthly 'Elaun Kenangan'. What I would like to see is that these heroes be given monetary incentives every 'Hari Pahlawan' on 31 July. I've started with the state of Kedah and Perak. 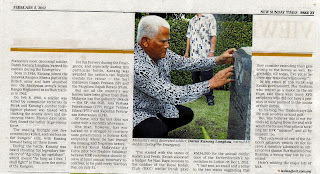 Kedah allocated a budget for Raya bonus to the caddies of Royal Kedah Club (RKC) whilst Perak gave RM34k for the annual function of Ex-Servicemen Association conference held at Lumut on 1 December 2011. (Copies of the RKC bulletin and newspaper cutting are attached). I had sent an e-mail and a letter to the two states suggesting that they consider extending their generosity to the heroes as well. Regrettably, till today I'm yet to receive any response whatsoever . I have no avenues to express my struggle other than writing to the agencies concerned. However, as an irrelevant and unknown rakyat, I don't think my letters receive the attention of the addressees. But, if it is highlighted in the mainstream newspapers, eg, NST especially from a popular columnist like you, I'm quite certain the relevant authorities might give some serious consideration. I would really appreciate if you could consider touching a little on this subject matter in your coming article. Thank you. Saya harap Pembuat Keputusan di peringkat nasional dan negeri akan membaca artikel tersebut dan seterusnya mengambil tindakan positif bagi menghargai pengorbanan wira-wira yang tak didendang ini. Di samping itu, para penerima KPK dan juga persatuan-persatuan bekas anggota Pasukan Keselamatan, seperti PBTM, PBPM, RAFOC, turut melobi kerajaan negeri untuk mempertimbangkan cadangan saya ini dan di sini. Fikir-fikirkanlah!! Tq 4 the effort and 2 Leslie it was a good write up, who knows it will trigger somebody mine? 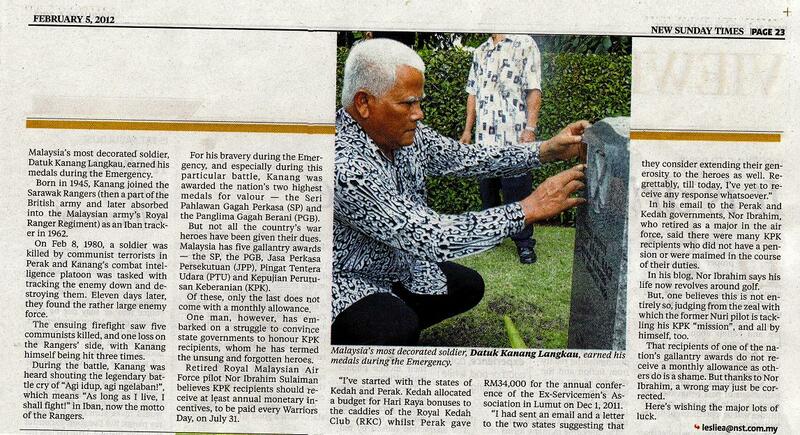 for KPK holders was given prominence in the NST 05/02.by none other than the editor Mr Leslie himself. I really admire your resolve in pursuing this issue soon after a bruising battle to get recognition for the holders of JPP and PTU. Without the untiring effort of this Maj pension this would never have been possible. Although they say rezki is dalam tangan, it is people like you that act as conduit to make it possible. I have observed that more than eighty percent of holders of the KPK are other ranks who could really do with the extra financial help. Being a federal award given by the King the onus should be on the federal govt to reward these heroes. Since the award for the JPP and PTU is RM. 1.000/ the KPK holders should be given at least RM.500/ monthly. This would not come to much and would be nothing compared to the excesses in public spending we are bombarded ever so frequently. 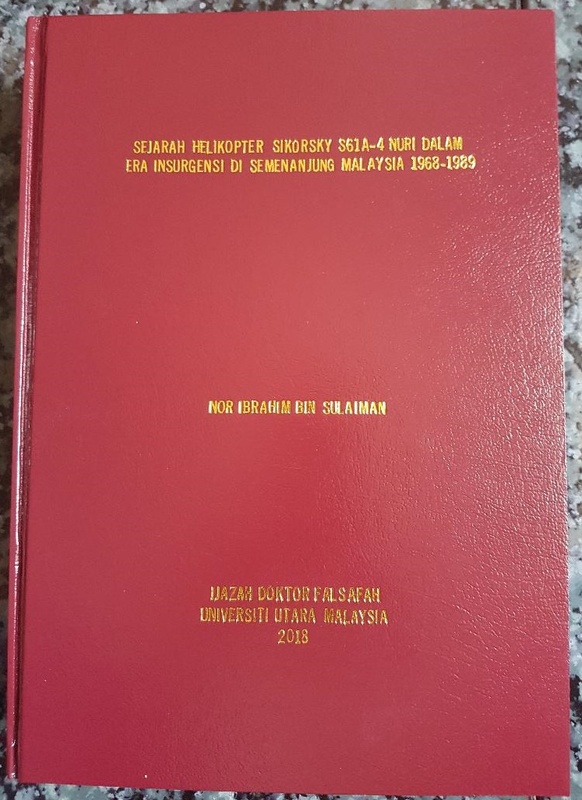 I however do however understand that your effort at this level had failed which is a shame really given the present political climate and all the campaigns about 1 Malaysia concept and the Rakyat Di- duhhulukan sloganeering which in this case rings hollow. Still you effort to get state governments to reward this particular batch of heroes deserves nothing but praise.Hopefully success will come given the spirit of the persistence peddler in you. On behalf of all the soldiers involved especially the Other Ranks I would like thank you very much for your noble effort. May Allah SWT bless you and your family. 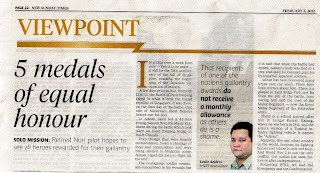 I did earlier on, read this NST column - smiled from ear to ear - and, sure, had it cut out for my keeping. Hopefully, whosoever concern, would have possibly read it and take note of it....serious thoughtful thinking to what have been written in the column. 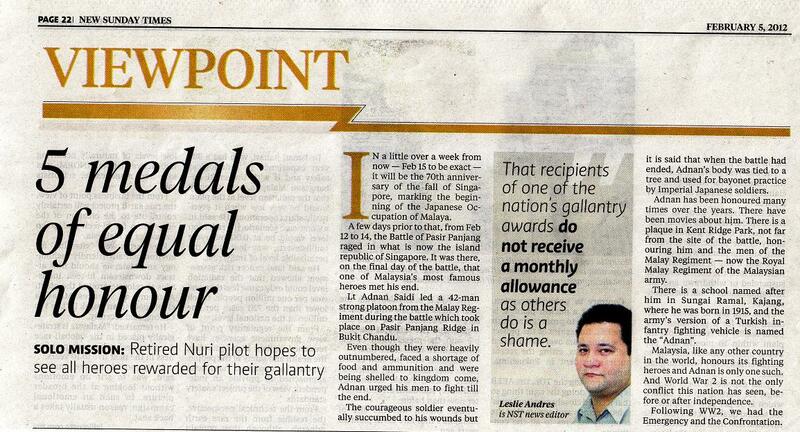 "That recipients of one of the nation's gallantry awards do not receive a monthly allowance as others do is a shame. But thanks to Nor Ibrahim, a wrong may just be corrected." Thank you. I really hope those decision makers read the article and take appropriate actions.